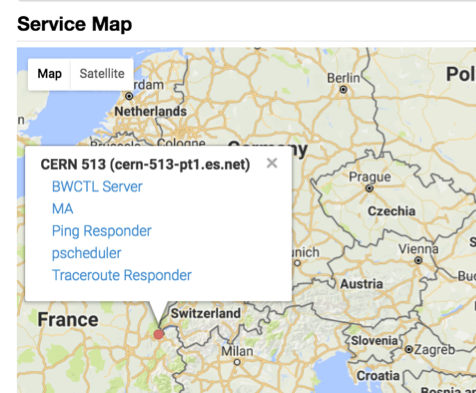 Interacting with this service can be done by scanning the map to find an instance where you may know a location, or by trying to search on specific terms. Note that map functionality relies on accurate latitude and longitude information, that is entered when the machine is configured. Machines that have inaccurate information will not be placed correctly. You can also query perfSONAR’s Simple Lookup Service (sLS) directly. find_ps_ma - a command line script that returns a list of MAs that have test results for given host. sls_dig - a script that is similar to “dig” tool. 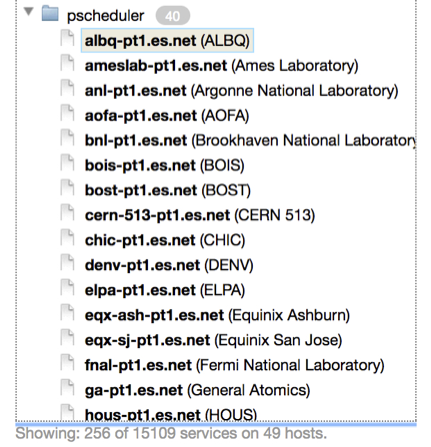 It retrieves information about a host registered in the sLS. If you are debugging an end-to-end problem crossing several domains, it is helpful to locate perfSONAR instances along this path. More instances help to divide and conquer a problem more effectively. As the domain, via their NOC or helpdesk system, if they have a perfSONAR node available for testing. It may be the case that it is not publicly advertised. Be prepared to send them your subnet information in the event the machine is protected by a firewall, and requires ACLs for access. If they do not have a node, ask them to review https://www.perfsonar.net/about/how-does-it-work/, which explains possible deployment strategies. In particular the beacon method, perhaps as a perfsonar-tools deployment, would work for a temporary debugging host. Engage the national Research and Education network (ESnet, GEANT eduPERT, Internet2) to act as a mediator for the request, and to track the outcome. Each deployed perfSONAR testing resource is owned, operated, and maintained by the deploying site; the perfSONAR project does not maintain any central control over these testing resources. Given this fact, it is pollite to always remember that measurement testing consumes network resources, and some facilities may appreciate testing traffic more than others. The perfSONAR project recommends a couple of guidelines when setting up tests to consider the nature of testing for networks of all sizes. Is the site connected at a large, or small, capcity. If a site has deployed a 1G perfSONAR node, they may not have a lot of bandwidth to spare. Equally, if a site has deployed a 100G perfSONAR node, the resource may overwhelm other traffic. How recent is the perfSONAR deployment. If you find a testing resource that is several versions old, it may not be well maintained and not very useful for network testing. Does the metadata associated with the service indicate a special circumstance of deployment. For example, if the host is connected via WiFi, is a smaller piece of hardware, or a Virtual Machine, it may not be the best thing to test against. One-Off or Short Burst Testing: If a single test, or short bursts of testing to aid in debugging, are desired it is unlikely that a site would mind their resource being used. Sites that have not explicitly stopped external testing, are giving an implicit permission to use resources for testing. Contacting a site to test may be polite, but should not be an obbligation. Regular Testing, Long Interval: Similar to the situation of a single test, a small number of regular tests (e.g. 1 to 2 per day) should not cause a hardship for a site that has deployed perfSONAR. Contacting a site to test may be polite, but should not be an obbligation. Regular Testing, Short Interval: Testing (e.g. several times per day) may begin to consume system resources in a noticable way, particularly when large amounts of bandwidth are consumed. If regular testing multiple times per day is desired, it is suggested that permission be sought, particularlly for a resource that may not be at a major internet crossroads (e.g. a campus, or facility). Coordinated Testing: Coordinated testing implicitly requires participation by sites (e.g. creating a shared configuration file), so there is a step that will require participating sites to install configuration and understand the number of tests that will be performed. Discuss acceptable limits in testing, and respect those that wish to keep the intervals low.